These Sub C Nickel Cadmium batteries are specifically designed for use in power tools such as Cordless Drills, Hedge Cutters, Lawn Mowers and garden clippers. They have a high discharge rate to cope with fast charging and high currents associated with use in mechanical devices. The Sub C cells size is standard in power tools and these cells come with heavy duty solder tags pre spot welded in position so all you have to do to replace your old ones is solder them together in the same sequence as they came out of the original pack. 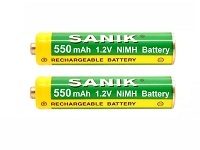 The NiCd chemistry of the batteries is excellent for delivering the current demanded by power tools. Batteries Plus has a large range of these NiCd Sub C rechargeable batteries so you can upgrade to a higher capacity (mAh) if you want. Your charger will be able to cope with this, the charge will just take proportionally longer though. The result will be a longer use time once the batteries are charged and this is easier on the cells as they have less of a demand put upon them. 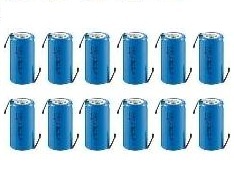 We supply single cells or packs of 10 for 12V tools, 12 for 14.4V tools and packs of 15 for 18V tools. If you require any information, please contact our office for technical advise.